Perfect for your travel or gym bag, maybe? 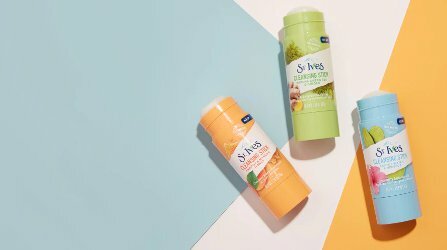 Cleansing Sticks from St. Ives: "Inspired by Korean beauty trends, this solid cleanser easily dissolves away daily grime while leaving your face feeling healthy and soft." In Cactus Water & Hibiscus, Apricot & Manuka Honey and Matcha Green Tea & Ginger, 45g each for $7.99. Looks good, has anyone tried? There are a bunch of reviews out there, including quite a few on YouTube, pro and con.